1. Roughly chop the cavolo nero and simmer briskly in a big pan of lightly salted boiling water for 3-5 minutes, or until tender. Drain and cool, then squeeze out the excess water. 2. Meanwhile, heat the olive oil in a large pan. Add the onion and garlic and sweat for 7-8 minutes, until soft but not brown. 3. Add the anchovies and stir until they dissolve into a paste. Pour in the cream and bubble until thickened a little. Stir in the cavolo nero, season with pepper and set aside. 4. 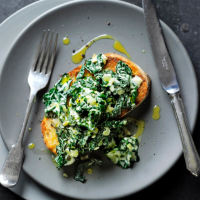 Splash the toast with oil and pile the cavolo nero on top. This recipe was first published in Wed Oct 01 17:11:00 BST 2014.